Performance Alerts are an Automate Task Type that will help you avoid PPC account surprises with performance-based email alerts that fire based on your most valuable KPIs. Getting started is simple. Set up an email alert to notify you of any drastic changes to your account, campaigns, ad groups, ads, or keywords by clicking into Alerts from Automate and choosing your KPI's and criteria. You can create an Alert from scratch, or use one of our Alert templates for inspiration. How do I set up a campaign-level Alert? 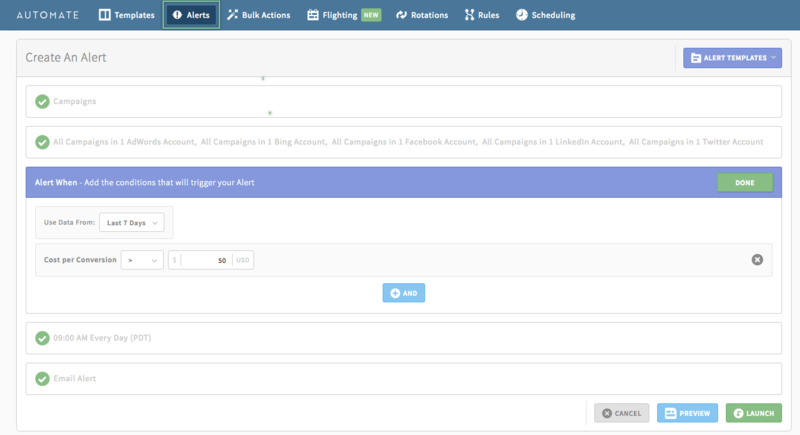 Step 1: Log in to AdStage, go to the Automate tab on the left-hand side and select Alerts. Step 2: Click Create Alert. Step 7: Choose the recipients who will be notified with this alert. Step 8: Preview the alert. If this is the alert you wish to implement, click Launch. Take some of the busywork out of your day by converting your Alerts into Rules by selecting the finished Alert and clicking "Covert to Rule" in the edit bar.